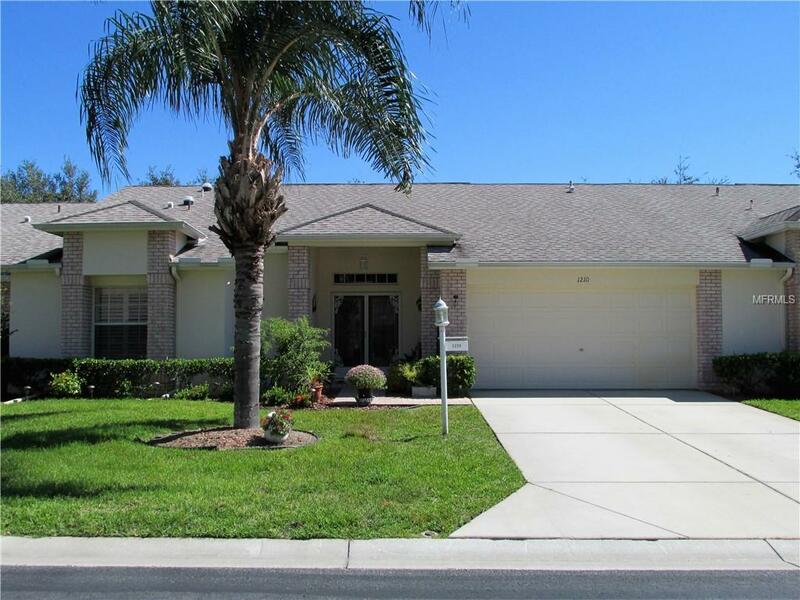 Enjoy the Florida Lifestyle in this beautifully maintained Villa with 2 Bedrooms, 2 Bathrooms, and a 2 Car Garage. As you enter the home through the Custom Double Doors youll find an Open Floorplan with over 1700 sf of living space, separate Dining Room area, Vaulted Ceilings, and a large Enclosed Lanai/Florida Room with glass sliders from the Living Room, Master Bedroom and Kitchen. This Villa which features a spacious kitchen with Granite Counter Tops, Wood Cabinets, Newer Stainless Steel appliances, Recess Lighting, Tiled Back Splash, Closet Pantry and a Breakfast Nook with Plantation Shutters in the Bay Window! The Master Bedroom is large with Laminate Flooring & two walk in closets. The master bath has wood vanity & tub w/shower glass doors & linen closet. The guest bath that has wood vanity & tub w/shower. The Guest Bedroom has Laminate Wood Flooring, Plantation Shutters & a Large Walk in Closet. The Laundry Room has Washer, Dryer & space for storage. You will enjoy sitting out on the Enclosed Lanai that has beautiful new Tile Flooring, a Ceiling Fan and a Park like setting. This home has a NEWER AC (2015). This home has a skylights for natural lighting. This exquisite, active Community offers a Beautiful Club House with Heated Pool/Spa, Restaurant, Fitness, Swimming, Tennis, Library and many other Community Activities and Events! Golf and other amenities also available for a fee. If you are looking for an active community come home to this beautiful Villa in this sought after community.